Issac is describing the diagram. He uses 3 steps in his description. Pick the best description for Step 1. The triangle on the left has a 90 degree angle, and has 3 sides. The isosceles triangle on the left has a 90 degree angle in the upper left vertex. The 2 equal sides are 2 cm in length. The triangle on the left is blue. Pick the best description for Step 2. The triangle has a 90 degree angle and is blue. The triangle is rotated and moved to the right. The isosceles triangle in the centre is rotated 45 degrees from the triangle on the left. It is translated 3 cm to the right, and has a base of 3 cm. Pick the best description for Step 3. The isosceles triangle on the right has a 90 degree angle in the upper right vertex. The 2 equal sides are 2 cm in length. The triangle is reflected from the triangle on the extreme left, and moved right 7 cm. The triangle on the right is blue. The triangle on the right is flipped and moved to the right. Jane Anne drew a design for the cover of her notebook. She describes it to a friend, starting from the centre and working to the outside. The center is a yellow square 2 cm X 2 cm. 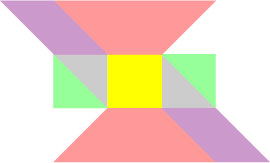 On both sides are squares, the same size, divided diagionally from left to right into 2 triangles - one triangle is green and the other is purple. The triangles are congruent. One square has been rotated 180 degrees, so the purple triangles are on either side of the yellow square. Above the center yellow square is a pink trapazoid with a base of 2 cm and a height of 2 cm. The top of the trapeziod is 6 cm. Below the center yellow square is a reflection of the pink trapazoid. To the right of the lower pink trapazoid is a dark purple parallelogram 2 cm at the base and a height of 2 cm. It is a reflection of, and is congruent with the dark purple parallelogram to the left of the upper pink trapazoid. Did Jane Anne completely describe the shape and orientation of each part of the design? Did Jane Anne describe all the transformations used in the diagram? Did Jane Anne describe any equal sides and use appropriate measurements?